President Donald Trump announced on Thursday that Secretary of Defense James Mattis will be retiring at the end of February. "General Jim Mattis will be retiring, with distinction, at the end of February, after having served my Administration as Secretary of Defense for the past two years. During Jim’s tenure, tremendous progress has been made, especially with respect to the purchase of new fighting equipment. General Mattis was a great help to me in getting allies and other countries to pay their share of military obligations. A new Secretary of Defense will be named shortly. I greatly thank Jim for his service!" Trump wrote in two tweets. ….equipment. General Mattis was a great help to me in getting allies and other countries to pay their share of military obligations. A new Secretary of Defense will be named shortly. I greatly thank Jim for his service! Mattis submitted a letter of resignation saying that Trump has the right to have a secretary of defense that shares his views and then listed various issues he and Trump don't align on. "My views on treating allies with respect and also being clear-eyed about both malign actors and strategic competitors are strongly held and informed by over four decades of immersion in these issues. 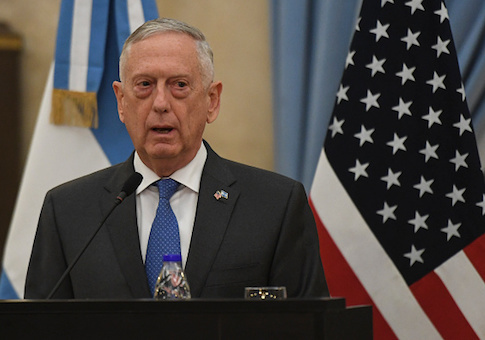 We must do everything possible to advance an international order that is most conducive to our security, prosperity and values, and we are strengthened in this effort by the solidarity of our alliances," Mattis wrote. "Because you have the right to have a Secretary of Defense whose views are better aligned with yours on these and other subjects, I believe it is right for me to step down from my position." Mattis also called out China and Russia for their malign influence in the geopolitics. "I believe we must be resolute and unambiguous in our approach to those countries whose strategic interests are increasingly in tension with ours. It is clear that China and Russia, for example, want to shape a world consistent with their authoritarian model – gaining veto authority over other nations' economic, diplomatic, and security decisions – to promote their own interests at the expense of their neighbors, America and our allies. That is why we must use all the tools of American power to provide for the common defense," he said. Mattis is the latest of a series of Trump officials to leave the administration. Secretary of the Interior Ryan Zinke will step down at the end of this year. White House Chief of Staff John Kelly will also be leaving at the end of this year. Trump also forced out Jeff Sessions, his attorney general, last month. Trump's announcement comes after he decided to withdraw all U.S. troops from Syria. Sen. Lindsey Graham (R., S.C.) claimed that Mattis disagreed with the president on withdrawing from Syria and said the U.S. job wasn't finished yet. "Secretary Mattis is firmly in the camp of the job in Syria is not yet done. That abandoning the Kurds now will hurt us down the road," Graham said. "That ISIS could and probably will come back. And I think that's the universal view of both [Secretary of State Mike] Pompeo and Mattis." This entry was posted in National Security and tagged Department of Defense, James Mattis, President Trump, Trump Administration. Bookmark the permalink.